Iranian deputy FM makes veiled hint against toppling Iran's Syrian ally, while confirming discussions with US on fighting ISIS. 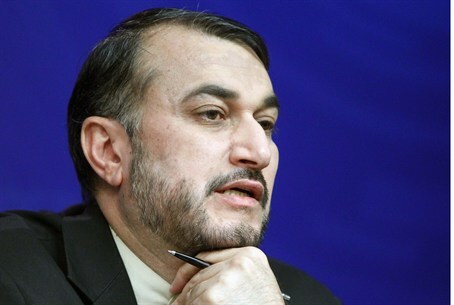 Iranian Deputy Foreign Minister Hossein Amir Abdollahian on Saturday warned the US that if America and its coalition tries to topple Syrian President Bashar Assad, Israel will be attacked, reports Associated Press. In fact, this is not the first time Abdollahian has made such a warning against deposing Iran's ally Assad; last September he likewise said a US strike on Syria would lead to attacks on Israel by "some groups and movements that have formed over the past two or three years." The statements are viewed by many as a thinly veiled threat by the Islamic regime, which has repeatedly threatened to annihilate Israel - just over a week ago for the Hajj pilgrimage Iranian Supreme Leader Ayatollah Ali Khamenei called for Muslim unity for Israel's annihilation. Iran has been actively pursuing those statements by continuing its nuclear program. A mass explosion occurred at Iran’s secret Parchin nuclear facility last Sunday - a site Iran has admitted has been used to test exploding bridge wires used as a nuclear bomb detonator. Iran has also supplied rockets to its terror proxies Hamas and Hezbollah to use against Israel. On another front, Abdollahian confirmed that Iran and the US have been in contact over the fight against Islamic State (ISIS) terrorists in Iraq and Syria, reports Associated Press. The comments are the first time a senior Iranian official has confirmed Iranian and American discussion regarding how to fight the ISIS threat. US Secretary of State John Kerry last month backtracked on his position about Iran's participation in joining the coalition fighting ISIS, after first not inviting Iran to a coalition meeting and then saying in an interview that he would be open to military cooperation. Israel has warned against a rapprochement between the US and Iran over ISIS, with Prime Minister Binyamin Netanyahu in his recent US trip warning Iran is "making bombs. That's what they're trying to do. That's what they're whole program is about, making bombs."